2016’s been a great year for HBO actors named Peter: Game Of Thrones’ Peter Dinklage received his customary Supporting Actor In A Drama Emmy nod, and Ghostbusters 2 and Ally McBeal co-star Peter MacNicol has been rightly celebrated for his screeching, vitriolic performance as New Hampshire political operator Jeff Kane on the most recent season of Veep. The powerful uncle of Timothy Simons’ simpering, loathsome Jonah, Kane was a strong enough character that HBO decided to submit MacNicol for an Outstanding Guest Actor In A Comedy Emmy, an honor he subsequently received. And then had taken away, in a bit of procedure-based chicanery that wouldn’t be out of place in a script for Armando Iannucci’s long-running political satire. As it turns out, you can’t be considered a “guest star” by the Emmys if you appeared in half or more of the episodes of a given season of TV. When MacNicol was submitted for what would have been his fourth Emmy nomination—after two nominations and a win for Ally McBeal—Veep hadn’t aired its season finale, meaning he’d only been in four out of nine of the show’s aired episodes. But his brief presence in the season finale, “Inauguration,” kicked him up to five episodes out of ten, causing him to be disqualified from the Emmy slate. 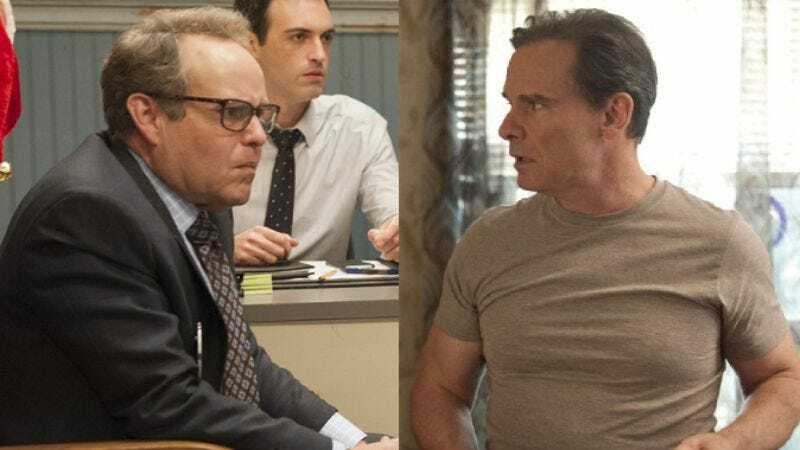 One Peter’s sad loss is another Peter’s happy gain, though: Variety is reporting that Peter Scolari will be taking his network-mate’s spot on the roster, for his recurring role as Hannah Horvath’s dad on Girls. Scolari is now also up for his fourth nomination, after three nods for Newhart in 1987, ’88, and ’89. Besides facing off against Larry David, Bradley Whitford, Tracy Morgan, and Veep’s own Martin Mull, Scolari will also be pitted against his old co-star from that brilliantly absurdist ’80s sitcom: Bob Newhart has been nominated (for the third time) for his recurring Big Bang Theory part as Sheldon’s Jedi-robed spirit adviser, Arthur Jeffries (a.k.a. Professor Proton).